Click to watch four minute video presentation of the rainfall and temperature forecast for Sep to Nov 2018. 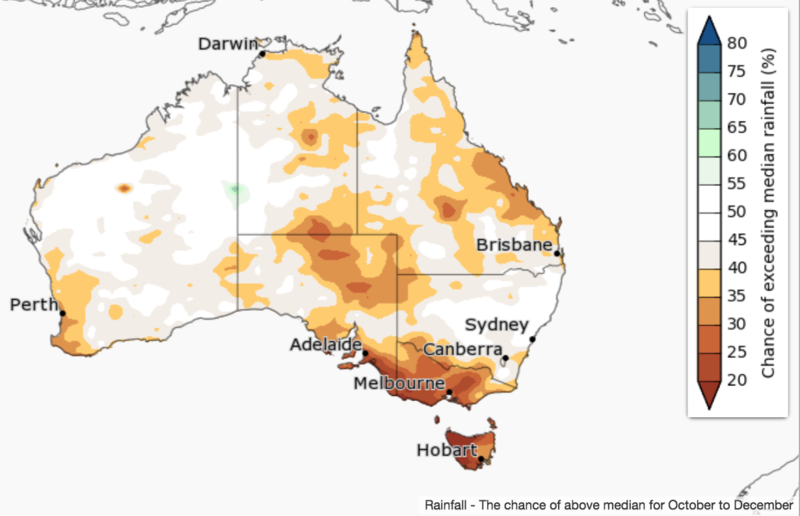 October to December is likely to be drier than average for parts of eastern and southern Australia. 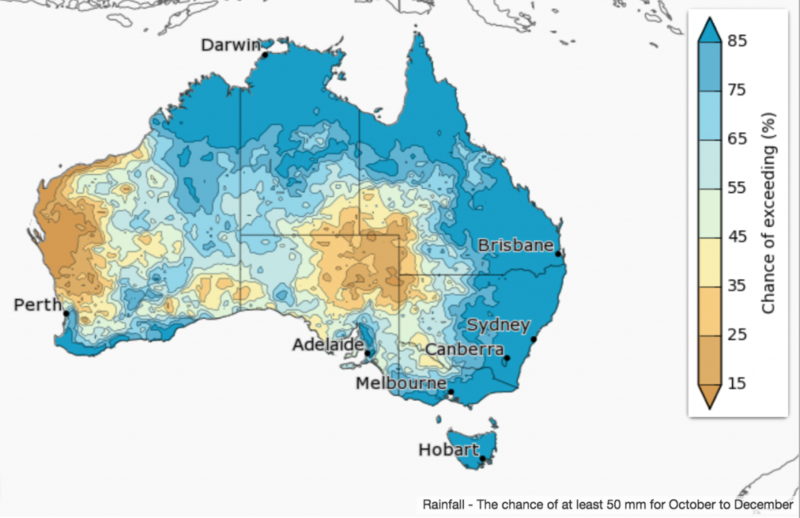 Specifically, scattered parts of Queensland, eastern SA, Tasmania, Victoria, southern and western NSW, along with southwest WA and parts of the NT are likely to have a drier than average October to December. 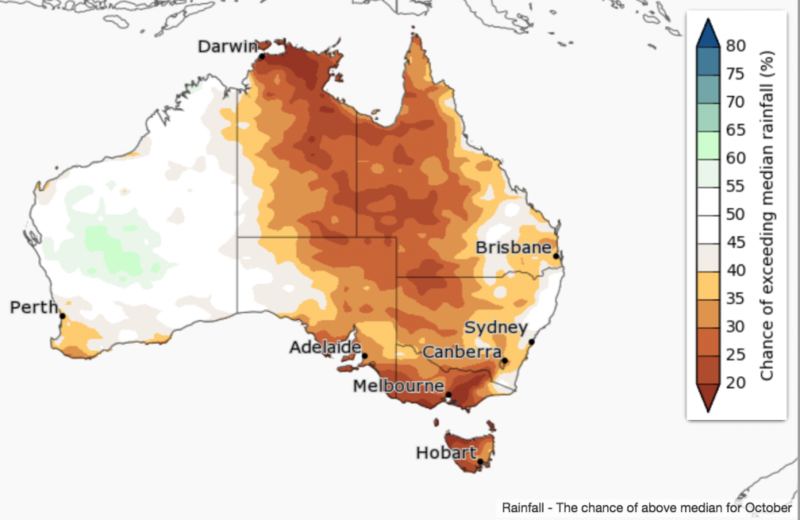 October is likely to be drier than average for large areas of Australia, but there are roughly equal chances of a wetter or drier three months over most of WA, western SA and parts of the east coast to the east of the Great Dividing Range. Much of eastern and southern mainland Australia have been very dry and warm since the start of the year. 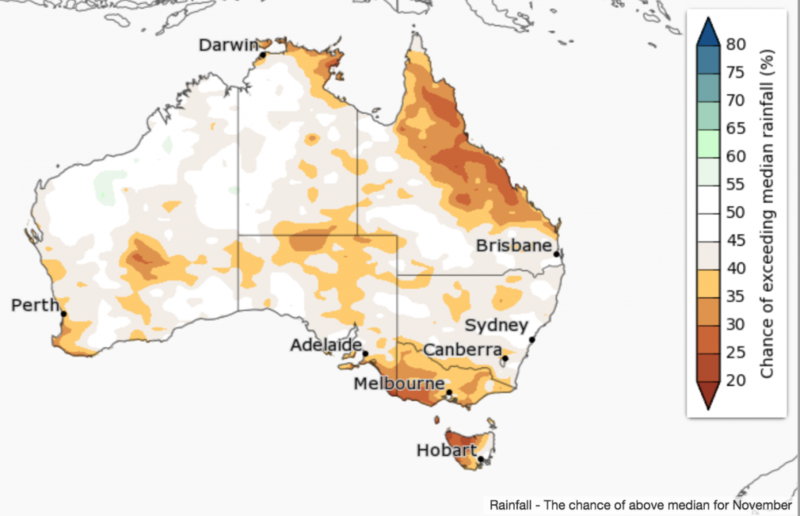 The October to December outlook indicates current drought areas are unlikely to see significant respite in the coming three months. Historical outlook accuracy for October to December is moderate to high over most of the country, except for WA’s Interior District where accuracy is low to very low. See map for more detail. 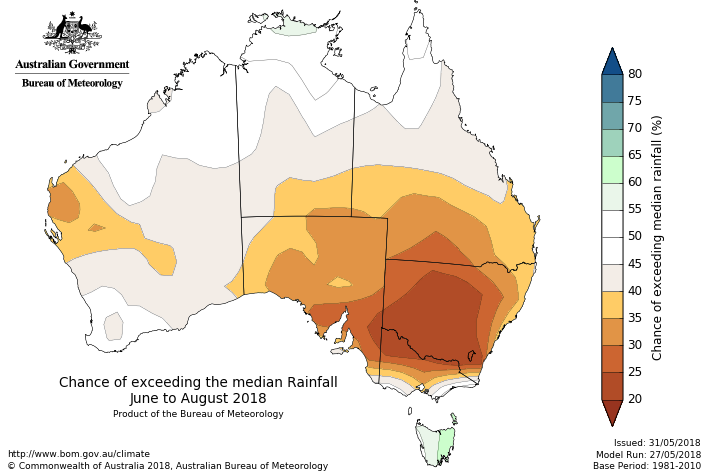 The above average daytime temperatures observed across Australia so far in 2018 are likely to continue for the remainder of the year. October to December days are very likely to be warmer than average for most of Australia. 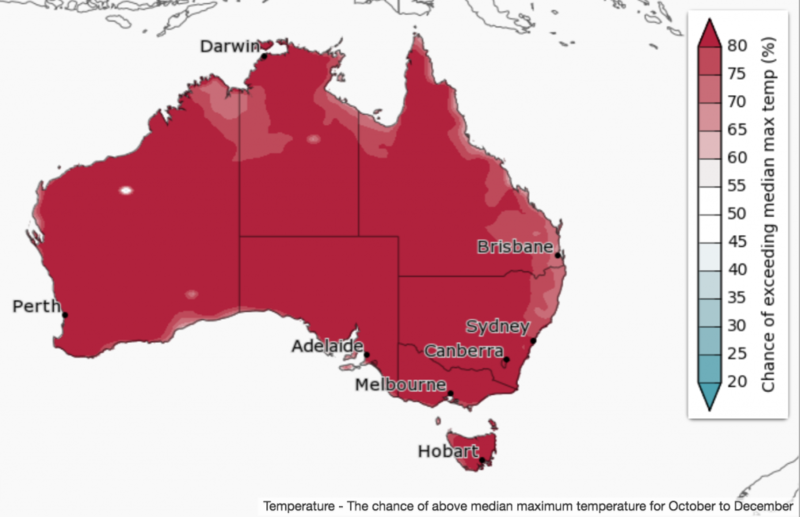 Chances of a warmer three months are greater than 80pc over most of the country. 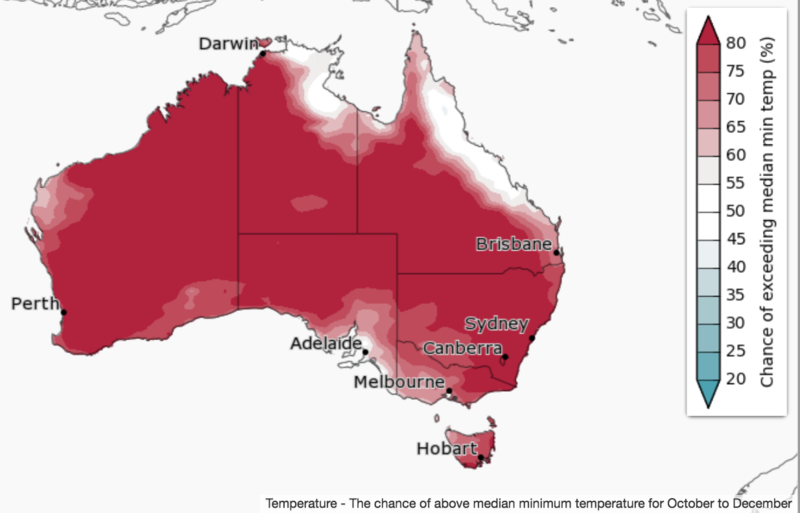 Nights are also likely to be warmer than average across Australia, except for the northeastern NT and the northern to central coast of Queensland, where the chances of warmer or cooler nights are roughly equal. Tasmania. Minimum temperature accuracy is moderate for most of the southern half of Australia, and the Top End of the NT and far north Queensland. Elsewhere, accuracy is low to very low.